Discussion in 'Auto News' started by GTPNewsWire, Oct 14, 2018. This article was published by Joe Donaldson (@Joey D) on October 14th, 2018 in the Automotive News category. AgentBlackDog and IngRobNy like this. To me, it’s literally just the ‘06 GT with a Chip Ganassi livery. FoRiZon, SiriusR and GranTurismo guy like this. FoRiZon and LMSCorvetteGT2 like this. I literally couldn’t agree more! Kingofweasles, Carbon_6, FoRiZon and 5 others like this. Literally in the figurative sense? Perhaps. Literally in the literal sense? Literally not even. The Superformance (yes, the hyperlinked title of the article as shown for the purpose of this dedicated discussion thread is incorrect, and the company's actual name is offered everywhere else) iteration, which is to say the one that has been on offer for literally some twenty years now, shares more visual similarities with the original British-built MkI GT40 than any other variant built by Ford or for Ford. Of course that's without even getting into the considerable mechanical differences between the "standard" Superformance car (the one that doesn't use components from the newest Ford offering) and the production car that bowed 14 years ago. ...somebody PLEASE tell these people to stop putting V6's into a car that was meant to use a V8. A V6 in a GT is a sin. TheNuvolari, McLover F1, Inferno251 and 1 other person like this. I never understood this argument. It’s not a muscle car, and its engine was never a big reason for why this car is so well remembered, it’s remembered for beating Ferrari. Four times. Had it have had any other engine the car would have been remembered and respected just the same. TexRex, TX Executioner, Michelin Man and 6 others like this. 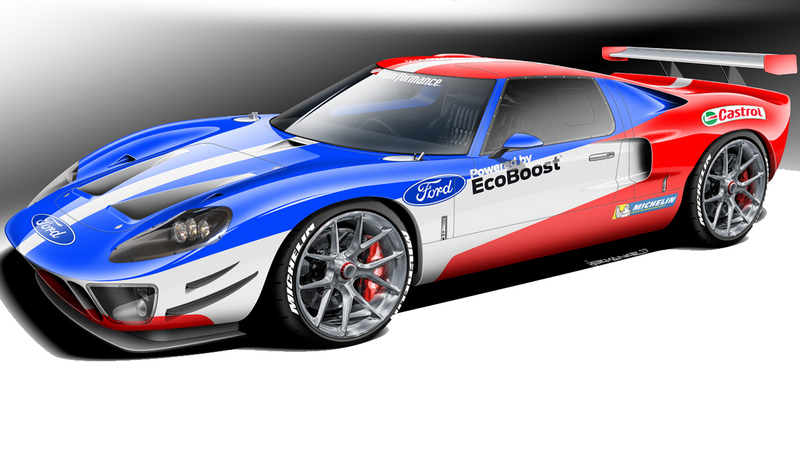 As much as I don't like the idea of Ford putting the Ecoboost V6 into the GT, I've come to accept & understand why. It's a racing car at its heart, all the reviews acknowledge this fact when they drive it. The necessary needs of the race car came first and the V6 was the better decision for Ford. The road car was nothing more than a secondary piece in development that Ford only legalized what it needed to make the race car usable for the street. This preview pics look like they've been poorly mashed together in Photoshop. Ew. TexRex, TX Executioner, Joey D and 2 others like this. It has the Chip Ganassi livery, so not every word. Unpopular opinion: I like the Chip Ganassi livery. Unpopular opinion: I agree (and I actually quite like the new GT), but I wish it wasn't Ganassi that ran them. Michelin Man and LMSCorvetteGT2 like this. I don't understand what Superformance has actually done here, besides draw a couple pictures and write a press release that GTP dutifully reported a week later. They've made these since the 1990s at least. They claim they put a Ford GT motor in this one? That's great. You won't be able to get one pre-installed in this... uh... GT40 rolling chassis they already produced. A V6 in the current GT is what best complimented the racing ruleset that Ford was trying to take advantage of at the time the car was designed. Just like the car in the 1960s was. GTboyz, RandomCarGuy17, Michelin Man and 5 others like this. Popular opinion: I wish Ford would've given at least one of new GT racecars to Gulf Racing. Very popular opinion considering I've never seen it before across the internet. I think they read an article about the Singer-Williams DLS and thought...'oh, you know what, we like money too'. This, to me, is something of a restomod, except without the annoying resto-part. So the "modern headlights" are just the original fixtures with GE Nighthawks dropped in. I'd have preferred headlights similar to those depicted in the render--that rectangular block looks ridiculous. Drop the sponsors/logos and the aero kit, and it’d look a like nicer and simpler imo.